Why isn’t there a gate at Gates Circle? Gates Circle is a part of the Olmsted Parks and Parkways System that Buffalo is known for (so is Symphony Circle, which we’ve already talked about). It’s one of two traffic circles on Delaware Avenue. The Circle has beautiful light fictures, two water-spout fountains, and a granite bench which circles the larger center fountain. It’s a neat design, because the fountain is sunken down, so from the inside of the circle, you can’t really see cars on the street, so you feel like you’re actually in a park, not surrounded by Delaware Avenue, which can get busy, traffic-wise. It’s been hot in Buffalo this week. 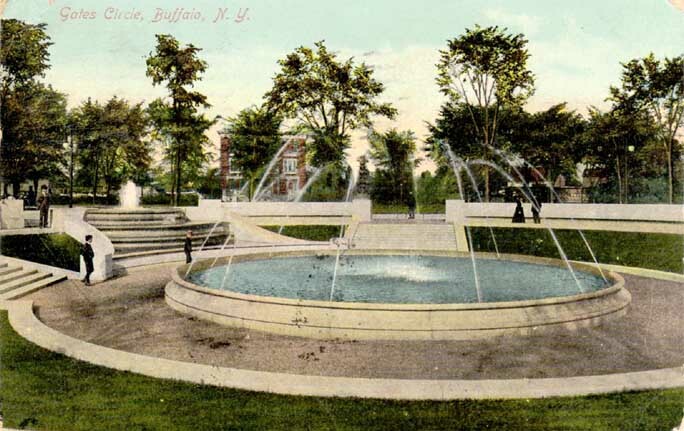 Maybe you’ve driven, biked or walked down Delaware Avenue and thought, “I really want to hop in the fountain at Gates Circle. 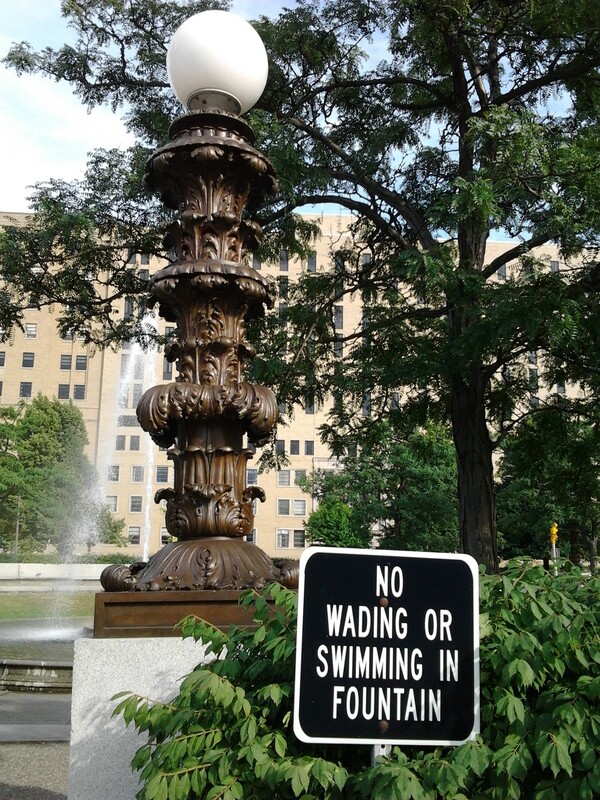 But then, out of the corner of your eye, you notice the sign….NO WADING OR SWIMMING IN THE FOUNTAIN. But swimming and wading wasn’t always forbidden…. Gates Circle was originally known as Chapin Place, as it is where Chapin Parkway originates. The circle was renamed in 1902, after being completed because of the generosity of Mrs. Charles W Pardee, a member of the Gates Family. The Gates Family lived at 938 Delaware Avenue (between Bryant and Hodge). Mr. Pardee was president of Buffalo General Hospital. I haven’t been able to find what the circle looked like according to Olmsted’s original plans. It anyone knows, let me know! The circle in its current state was designed by EB Green in 1902 and was finished in 1904. EB Green is a famous architect who designed many important buildings in Buffalo in the early 1900s. His design for Gates Circle included ornate light standards and fountain. I’ve heard that the lights came from the Pan American Exposition, but I haven’t been able to confirm it; most likely, they were simply inspired by the Pan-Am. In the 1930s, you could swim at Gates Circle! In 1938, there was some concern regarding the children swimming. However, in July of that summer, the Police Commissioner and Parks Commissioner came to an agreement to allow swimming to continue. Apparently, there had been thoughts that it could be a danger because of the traffic and the purity of the water due to it not being chlorinated. Police protection was provided and the Board of Health tested the water and found it was as clean as the City drinking water. Additionally, a “matron attendant” was on duty during the hours of 10am to 6pm to help deal with the children in the fountain! I’ve never tried this, but apparently, the benches of Gates Circle function as “Whispering Gallery”. Similar to the effect which occurs in some museums which are acoustically designed, you can hear someone speaking when they standing across the way, as long as you face the benches when you speak. In 1945, geologists from the science museum studied the circle to try to figure out why this phenomenon occurs. It is believed to be because the sound travels through the granite across the curve of the fountain. So, if you happen to see a girl standing at Gates Circle whispering into the benches like a crazy person, stop halfway around the circle and say hi! “Gates Circle Still Haven”. Buffalo Times. July 28, 1938. Clipping found in Buffalo Streets Scrapbook, Vol 2. “Gates Circle Mystery Baffling to Observers”. Courier Express. August 12, 1945. Clipping found in BECLP Buffalo Streets Scrapbook, Vol 2.